Are you planning enhance your sightseeing experience by taking a voyage on the refreshing blue waters of the Bur Dubai Creek along and the beautiful city skyline? Book your voyage with Dubai’s biggest stylish sailing catamaran, On Vera VI for a truly unforgettable and soothing tour. It is 82 feet in length and was built in France in 1993. 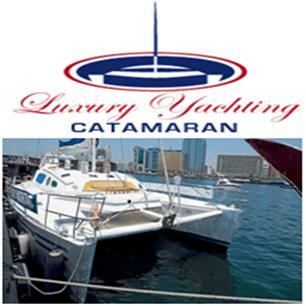 The beautifully designed On Vera VI, aluminum sailing catamaran, is a unique product of the “Luxury Yachting Catamaran.” It has the capacity to accommodate around 82 customers at a time. That is the reason why this romantic venue is a superb excuse to organize get-togethers and parties, enjoying the amazing trip around Dubai’s coastline. In short, On Vera VI is your golden chance to discover the beautiful Dubai from the sea. In order to know about the operational hours of the On Vera VI Bur Dubai, call at the number given above. Deira City Centre Metro Station 2 is On Vera 6’s nearest Metro Station. It is 1.9 km, making a 25 minutes’ walking distance. Once you reach the metro station, head south on Al Ithihad Rd and then take a slight right to stay on Al Ithihad Rd. now turn right at Baniyas Rd, continue straight onto Baniyas Rd and take a left turn. Take first exit at the roundabout and then another first exit at the second roundabout. Find your destination right in front of you. Creek Golf & Yacht is Onverra 6’s nearest bus station. It is 1.3 km away; making just 16 minutes’ walking distance. Use bus No. 22, 27, 33, 88, C10, C14, C15, and C19 to reach this bus station. Once your reach here, head northwest on Baniyas Rd, take a left turn and then first exits at the two upcoming roundabouts and find your destination right in front of you. View Map.